A friend recommend Jimoco awhile back, but since I no longer live in the Tri-city area, I just never found the time to visit. A couple weeks ago, P had a birthday party which was initially suppose to be at Raku Raku, but since they didn't have room to accommodate our party, so we changed it to Jimoco at the last minute. This suited me fine, since I been meaning to check it out ever since Sherman blogged about it. The restaurant was not eye catching by all means. In fact, it looked quite small from the outside. Although we were there on a Wednesday, the place was quite busy which was definitely a good sign. First we got the garlic bread, and it was alright. Although toasted, but a bit uneven, with some parts being crunchy while others are soggy (from the garlic butter). All their pasta ranged from $13-15, so the prices are a bit high. However they seem to have a never ending "Grand Opening Special of 2 for 1", so in reality all the pasta were about $7-8. I had Fusilli alle Salsiccie. Although I liked the al dente pasta, but the rose sauce was disappointing. Typically this sauce would be a nice blend of tomato and cream, but here it was mostly tomato sauce. Also, they don't offer any cheese or pepper like typical pasta restaurants. R ordered the Piccata Parma with pork tenderloin in a masala cream sauce with porcini mushroom. The pasta was rather bland and the meat was just alright, not tender enough. The masala cream sauce was also on the lighter side. The biggest problem I had with this was the timing, you see each plate of pasta came out at different times, so by the time the birthday girl's pasta arrived, this was pretty much cold. Also, because it was served on a flat plate, the heat dissipated really fast. A ordered the Linguine al frutti de mare with white wine sauce. I did like this sauce, as you can taste the slight white wine infused in the garlic olive oil sauce. It wasn't really salty, but I preferred it this way, because you can really taste the fresh seafood flavor. You know the expression save the best for last, well in this case it's true. K had the seafood linguine in a spicy tomato broth (aka Linguine Soul), and it was absolutely delicious. First off, what's with the portion, it seems twice the amount comparing with everything else. Also because it's more of a broth than sauce, thus the whole dish stay hot through out the meal. The sauce was nice combination of Korean hot sauce and tomato sauce. The didn't skimp out on the seafood either, there were quite a few pieces of prawns, scallops, clams, and mussels. So if there is one dish I recommend trying, this is it. The one thing I learned while dining here was that the restaurant owners are Korean and as well as the cooks. This was really not surprising, consider the sauces here are more like fusion than traditional. Anyways, the food here was okay and the portion only moderate, but for the price you pay, I'd say this is a good deal. 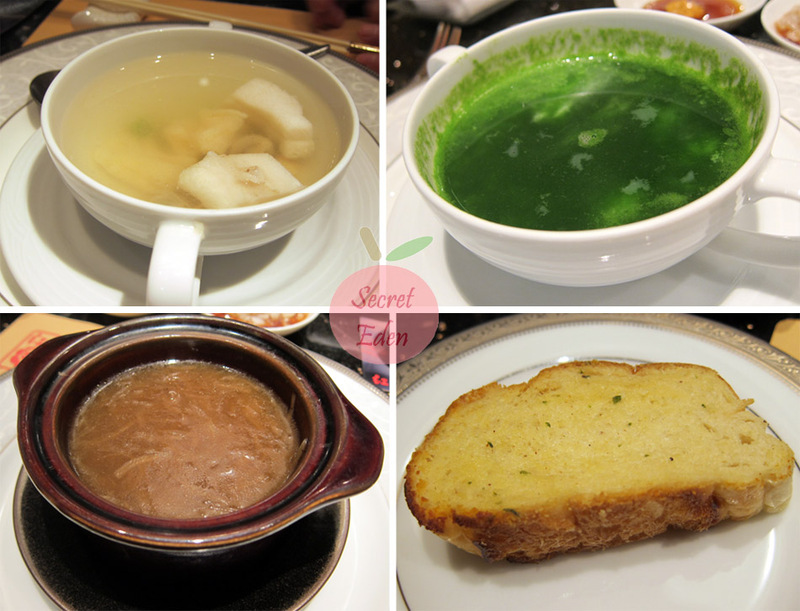 Over a week ago, Elaine of O My Sweet Tooth extended an invite for an tasting event at Cute Pearl Tea House. This particular event was mainly focused on a new item they would like to launch, and for sure there was NO WAY I was going to miss it. Why? 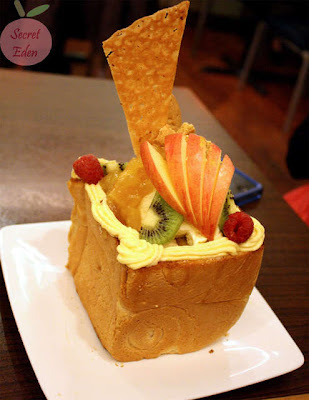 Because this was for none other than my favorite: Honey Toast Box. If you've been following this blog, you will know that I am 'obsessed' with Honey Toast Box. Not only did I went out looking for places that served this, but I also created my own DIY version. On top of that, I always like to meet new people, so I gladly accepted this invite and off we went. A total of 3 bloggers attended: Elaine of O My Sweet Tooth, Buddha Boy and Buddha Girl of Food for Buddha, and of course myself and R. First of, I would just like to say we had a fantastic time chatting and it was a pleasure meeting you all. Anyways, back to the food, or in this case drinks. I ordered the fruit green tea, which tasted like a tropical fruit juice with a hint of green tea. This was not overly sweet like some others I've tried. 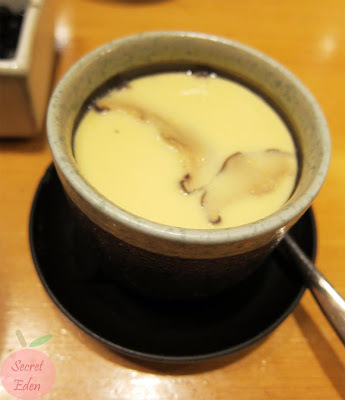 R ordered the Oolong milk tea, which I loved, because it was creamy and had stronger tea flavor comparing to mine, but R thought it was too sweet. Elaine had the passion fruit tea and Buddha girl had the lemon aloe juice with crystal pearl. The prices here are on par with places like Bubble World, with drinks starting at only $3.25, and going up to $4.50 for specialty items. I would consider this cheap, since the other day I paid around $5 for a Jasmine milk tea without pearls at Tri-ty cafe. 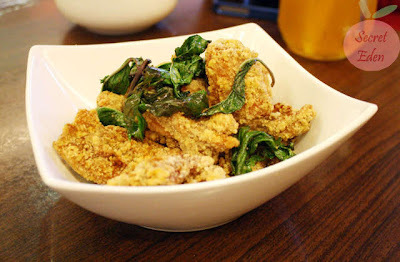 The 1st appetizer we got was the Taiwanese Deep Fried Chicken ($5.50). They brought us the authentic kind with fried basil leaf. Apparently you can also order it without the basil leaf. 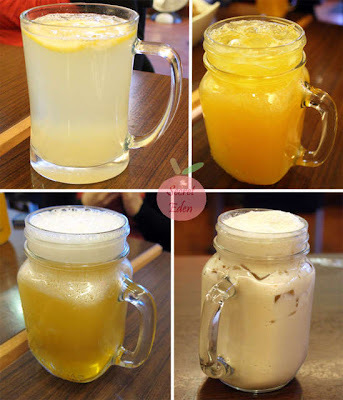 Although flavor here is milder comparing with other bubble tea joints, but both R and I thought it had just the right amount of season, also the chicken was rather tender and juicy. 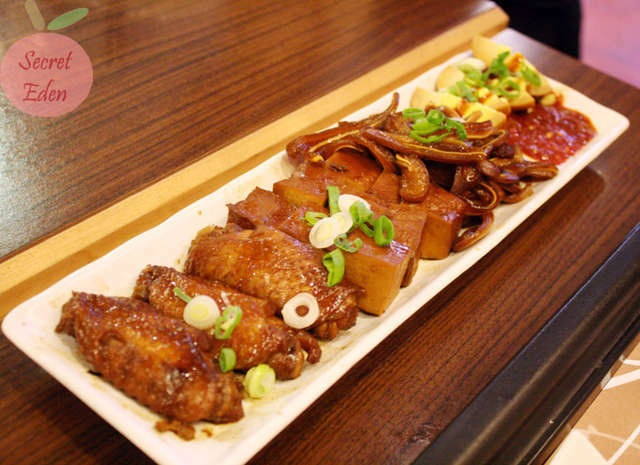 We also got an assorted platter of marinated items including chicken wings, bean curd, pig ear and egg. 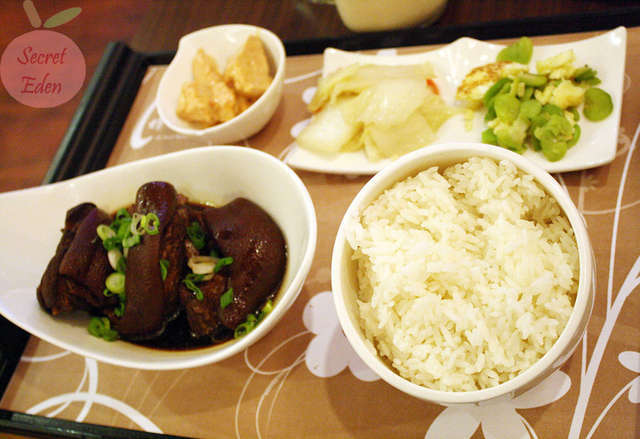 The bean curd was rather salty, but the rest was not bad, especially the crunchy pig ears. The marinating sauce was generally on the sweeter side of things, but I would have preferred a more balanced flavor. Actually this is not my first time visiting Cute Pear Tea House, I've been here numerous time when I was studying at UBC. My favorite has always been their deep fried Chicken Leg meal ($6.75). I can't believe their price is still so low, it's even cheaper than Bubble World. Anyways I am not sure if it's because I had glorified memories of this dish, but it didn't really live up to my expectations. Although the chicken was crispy, but it wasn't as juicy as I've liked. Also the coating was rather thick. Despite the mishap with the chicken, the flavor was still as good as I remembered: salty/peppery with a hint paprika like spice. R ordered the Pork Knuckle with Rice. Although they say it's pork knuckle, but it was more like boneless pork hock. The skin was soft yet still retained that chewiness. The meat was very flavorful and soft. 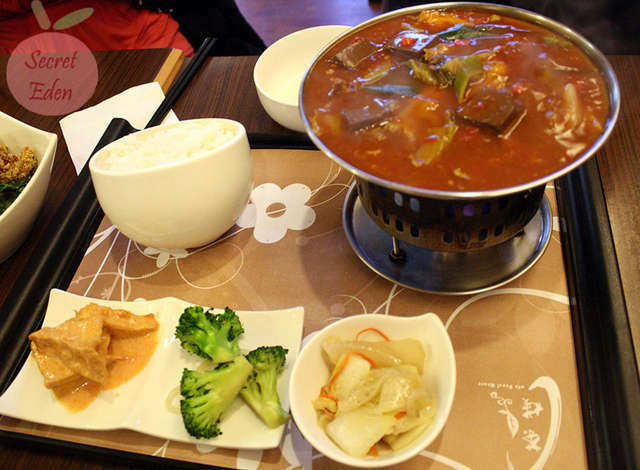 The sauce was a nice combination of savory and sweet flavors, and it goes great with rice. For only $7.25, I highly recommend this, as they were definitely not stingy with the pieces. After a very fulfilling meal, the 'stars' finally arrived. The first toast box we received was the Apple Crumble Honey Toast Box. All the toppings you see were made in house. I particularly enjoyed the apple sauce, because its tartness really balanced out the rather sweet toast sticks and ice cream combination. As much I loved the toast sticks inside, but I was not a fan of the box itself. The box was only lightly toasted with nothing brushed on. Therefore the box was only slightly crunchy, and had no flavor. Because it wasn't toasted long enough, the box became soggy easily. The Chocolate Brownie/Banana Honey Toast Box came next. Because this dessert was already topped off with banana, ice cream and chocolate syrup, thus the addition of the chocolate brownie was a bit much, because it turned into some serious sugar overload. Here is what the inside looks like. These toasted bread sticks was delicious. They were sweet, buttery and crunchy on the outsides, and still soft on the inside. Now, if the whole box was toasted to this consistency and actually tasted like this, I think I would definitely finish the whole dessert box without a question. 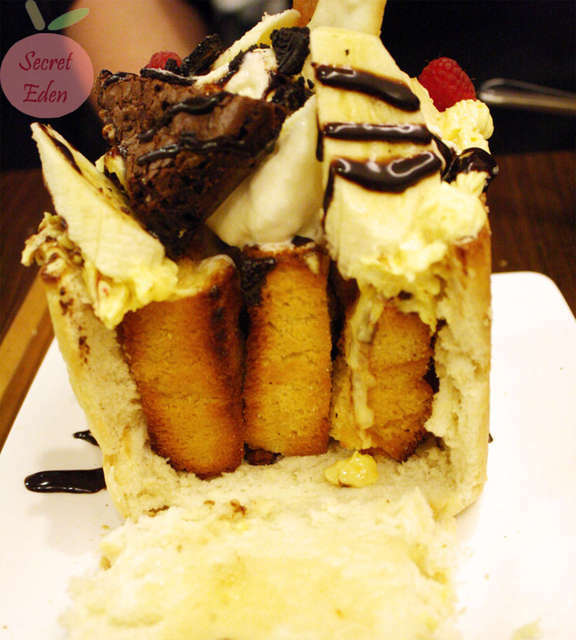 The last toast box was the Strawberry Honey Toast Box with pudding. You see they actually had another pudding flavor, but we really couldn't eat that much food. 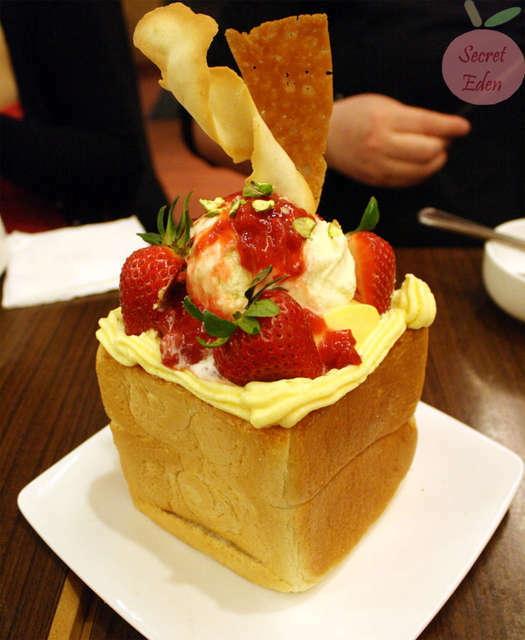 They have combined the pudding and strawberry together in one toast box per Elaine's request. 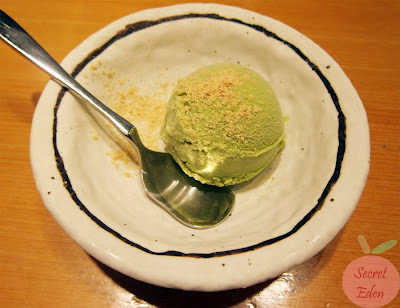 Just in case you don't see it, that light yellow custard resting underneath the ice cream is the pudding. If I had to pick a personal favorite, this would be it. I loved the fragrant, yet tart strawberry sauce on ice cream with the sweet bread sticks. I just wish there were more of the sauce. On the other hand, the pudding really didn't add anything, because it's texture and taste just was too different and did not mix well in general. 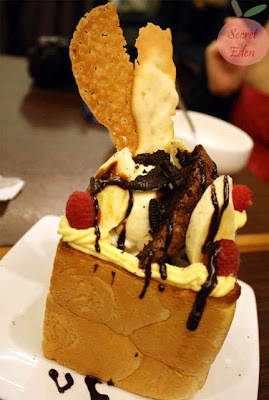 Anyways here is a short summary on what R and I like and disliked about these Honey Toast Box. We did give them these feedback right away, so the version they launch should be even better than the ones we tried. On the side note, they mentioned the price range would be around $7-8, which I think is quite reasonable consider the amount of work required. 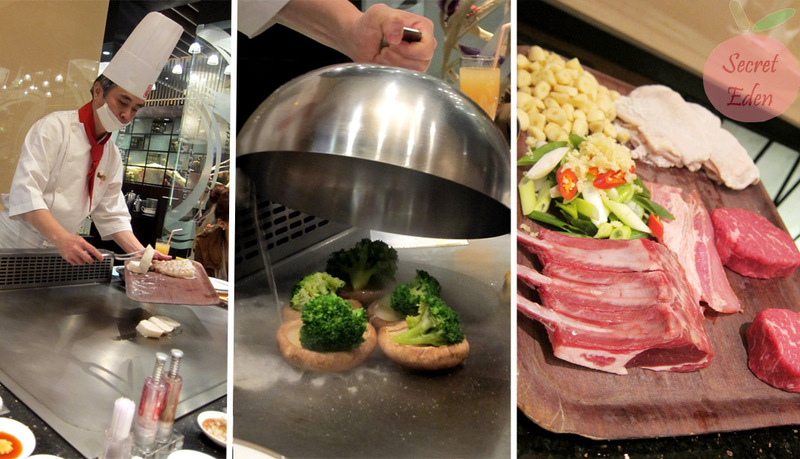 Not only does Taiwan has tons of delicious street food (see proof here), but they also have many great restaurants. Since R is a big fan of Teppanyaki, we decided to check out at least one. 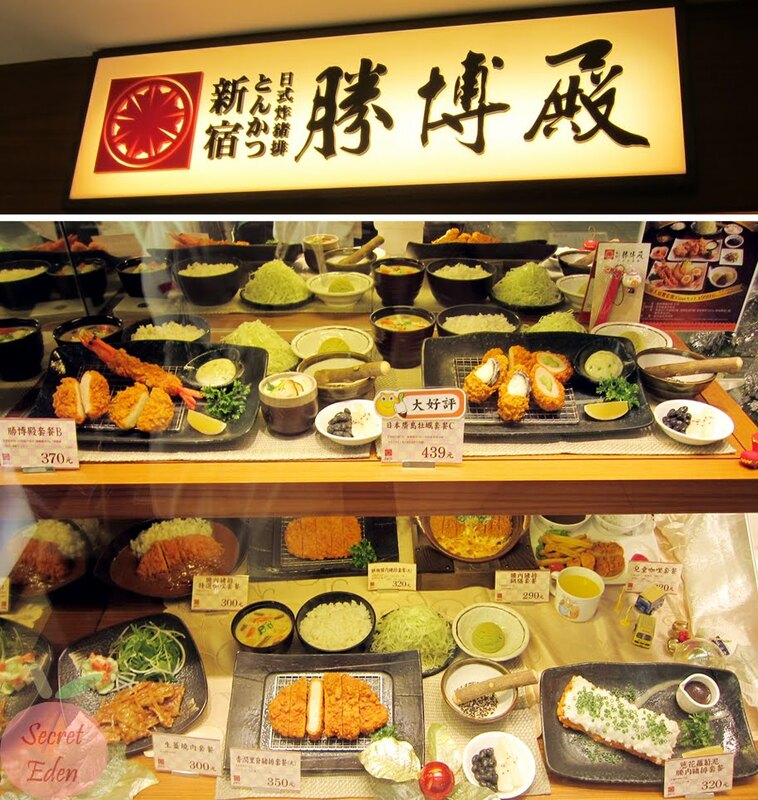 Just like specialty tonkatsu shop, there are many choices with different price range, some are only $14-$20 for a meal, while others can cost up to $80-$100. The one we decided to check out was located in Taipei 101. 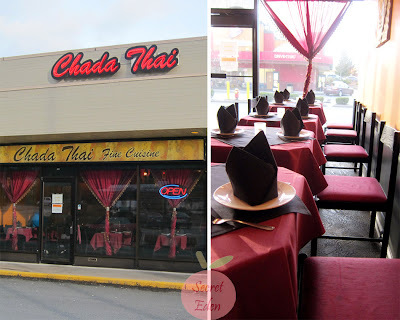 If you ever been there you know this was not going to be cheap, as it was a nice restaurant in a high end mall. The restaurant was quite upscale with nice decor and good ambiance. Each grill was house in an individual dining room which can accommodate 6 people or more. I guess this will ensures that each chef will not be overwhelm by the amount of order they have to take. We ordered the set meal costing $1680($56)/person with additional 10% service fee. Although the price was certainly expensive at first glance, but take a look what was include, you will see this was definitely a worthy meal. Since there were 3 of us, so we each chose a different soup. The first was the mushroom/seafood soup, which had almost oil free, yet it has very flavorful. R soup was the spinach soup, which to me looked a bit scary since it's so green. However the soup did not have the 'grassy taste' due to the grind up spinach, but I didn't particular love it either. Lastly, I had the French Onion soup which was thicker in comparison. The soup base was rather meaty, I would have wished for a lighter taste. All soup came with a slice of garlic bread, and it was pretty standard. Next up is the cold plate appetizer: smoked salmon with crab salad/caviar, and salmon roe. The crab salad was super fresh and just the right amount of mayo, so that it doesn't over power the seafood flavor. The smoke salmon was also very good and not mushy at all. 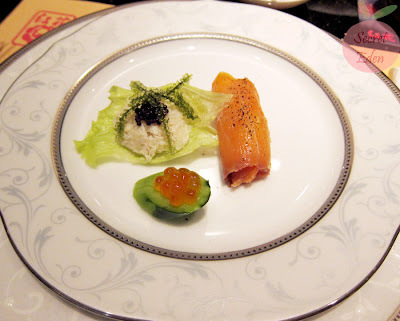 The salmon roe was very fresh. If you are very observant, then you must have noticed those green globes that looked like tiny grapes. 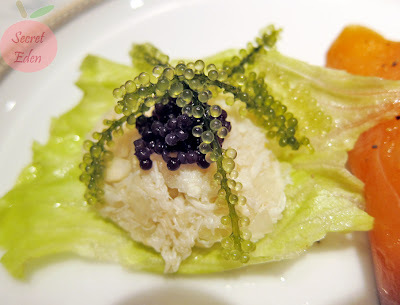 These are widely known as green caviar or sea grapes (aka vegetarian caviar). I was definitely fascinated as this was my first time trying them. These tiny sea grapes were succulent and tasted like kelp, but lighter. The 3rd course was a refreshing salad with a citrus dressing. Although there were a few pieces of lettuce present, but it was mostly a fruit salad. 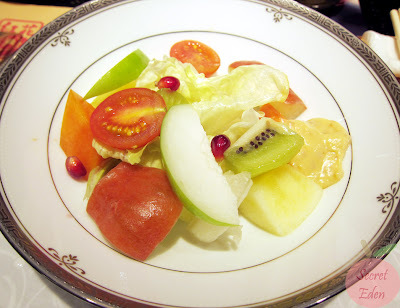 Just like the seafood appetizer, all the fruits was fresh and delicious. The sweet yet slightly tart dressing really complimented the fruits and opened up ones appetite. The first hot appetizer was the lightly season grilled prawn. The meat was cooked to perfection, so it has that snap to it when biting in. 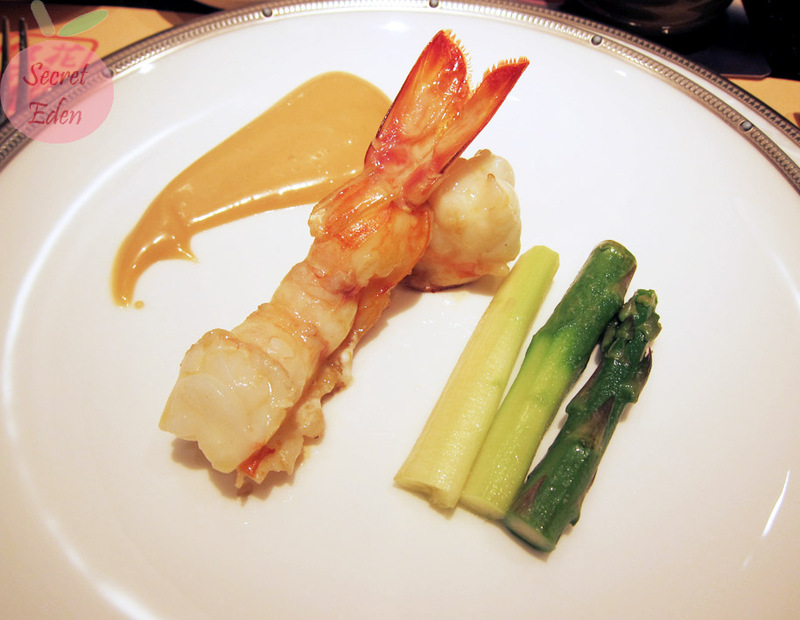 Although there was a side of honey mustard sauce, but I think the prawn should be enjoyed as is to taste its freshness. Next up was grill fish fillet. I am not too sure what kind of fish was used, but it could either be cod or halibut. Anyways, this was also grilled to perfection, as the outside was slightly crusted, yet the inside was still succulent and soft. The fish is only season with some salt and pepper, but they did not forget the people who needs a little more flavor, as there was a side of fresh salsa. R's entree was the grille lamp chops. 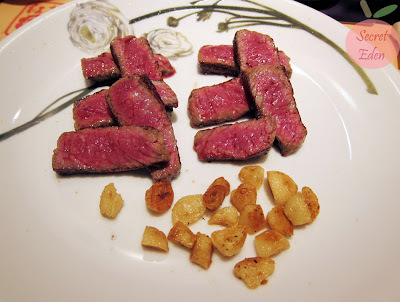 This was also done very well, the meat was tender yet chewy (in a good way). Lamb could easily turn out to be gamey if not cooked properly, but here that was definitely not a problem. They certainly do pay attention to details here (just like my pre-cut steak), they wrapped the end of each lamb chops, so that you hand won't get dirty if you decide to pick it up. The last entree was the chicken breast. At first when I saw it on the menu, it sounded least interesting out of the 3, but once it was served, I know I couldn't be more wrong. The chicken meat was juicy and soft, and the skin was nice and crispy without any fat. 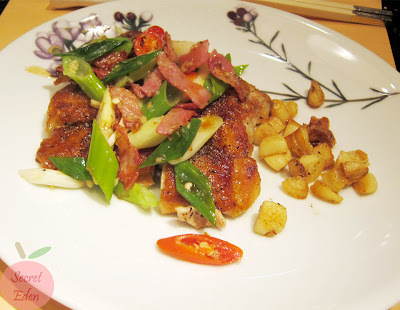 They also served with a side of sauteed bacon, chili pepper and green onion. This was the a great addition, as the chicken was not as flavorful as the lamb or beef. So if you think that's it, there is more. 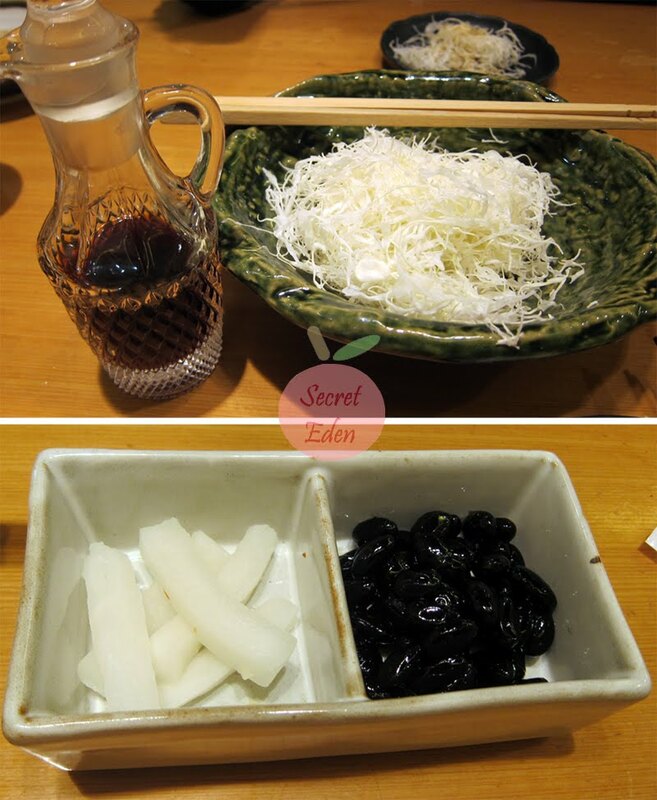 I missed a picture of the last dish, which was a plate of teppan bean sprout/mushroom. I guess they just wanted to add this to clean your palate and add some veggie after all that meat. There was no question that I was stuffed from the meal above, but there was still dessert. Outside Hunghwa, there was adjoining coffee lounge, and that was where they took us to serve the dessert. I guess this way you won't have to smell other's food or inhale any smoke while eating your dessert. Plus the ambiance was much better suited for tea/dessert. If I had to pick the most disappointing dish of this whole meal, I guess I will have to go with this. It was just your average coffee cake with icing. I know this meal was not cheap, but we had a grand total of 8 dishes, and that average of $7 dollars per dish. Given the fresh ingredients and the excellent execution, I'd say this was a very worthy meal. 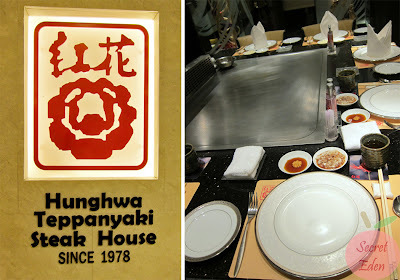 So if you like food that are fresh food cooked with minimal spice/sauce then Hunghwa Teppanyaki definitely definitely can not be missed. Acme cafe is located on Hasting street, and it is literally the last shop before the typically Chinatown scene hits. 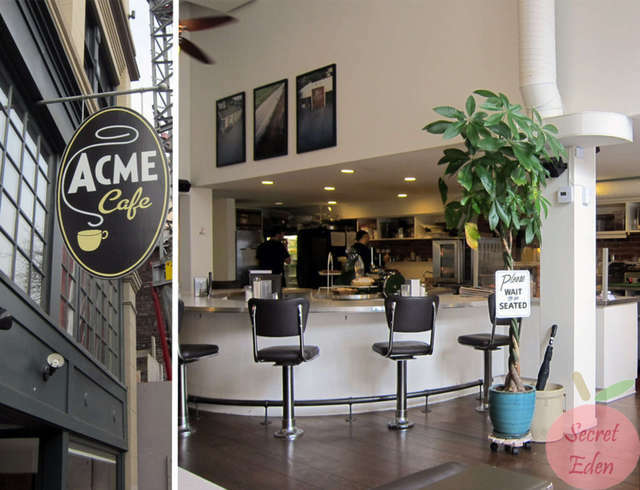 The shop itself was quite spacious and bright, and it had an upscale diner feel to it (especially with the diner bar type setting). Since R love eggs, he went for the daily quiche with soup and salad for $9.50. The soup of the day was tomato and endive soup. It was really hearty and chunky. Although I am not a fan of tomato soup, this one was not bad. The flavor was smooth without being too acidic, and the vegetables tasted fresh. Neither R nor I was a fan of the salad, it was rather bitter. However this was all made up for by this lovely smoke salmon/pea quiche. To quote R: "this is the best quiche I've ever tried." 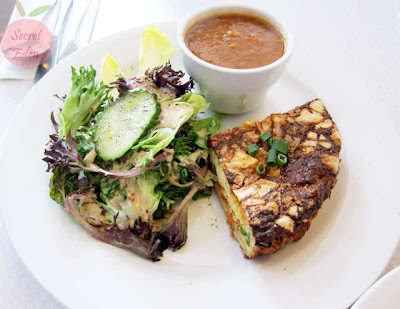 The quiche had a special crust on top, thus it added a whole new texture when biting into the flavorful salmon/egg filling. The richness not only came from the almost undercooked eggs, but also from the Swiss cheese they mixed in. Initially R thought the price was a bit high, but now he believes it's totally justified. For myself, I ordered the High-falutin's Grill Cheese sandwich with almond broccoli coleslaw and chips ($11). The sandwich was made with cheddar, swiss, brie, cranberry-Grand Marnier relish. 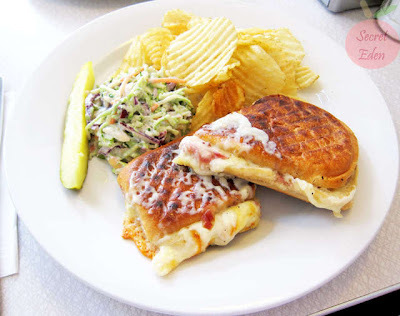 I loved this mixture of cheese, and the sweet yet slightly tart cranberry relish. However I wasn't too fond of the Ciabatta bun, because they really pressed down when grilling it, thus the bread was extremely hard and crunchy. I would have preferred a more crispy yet slight soft type grilled bread. Also because of the multiple cheeses they used, this sandwich was a bit greasy to the touch. On the other hand the almond coleslaw really stood out, because they used almond slivers instead of slice, so it really enhanced the flavor and texture of the coleslaw. Although we were full from our entrees, but I just couldn't pass up on dessert. It seems their dessert changes from day to day, so you will just have to ask when ordering. For our dessert, we went for the Apple Crumble (~$4.75). 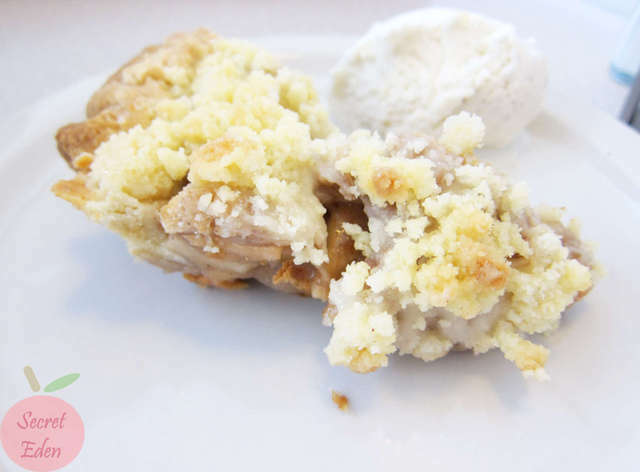 They used chunky apples for the filling, thus it wasn't mushy at all, in fact I though it was a bit too hard. The apple was rather tart, but it was balanced out nicely by the sweet 'crumble' on top. The side scoop of vanilla ice-cream was $0.75 extra, but I think it fail to serve it's purpose, because the apple crisp was served cold. Vanilla ice cream is only good with warm desserts (IMO). In general, I love this rather new cafe, it just give off a different feel from other typical sandwich shops. Prices here are not exactly cheap, consider I just paid $11 for a sandwich. However I would still recommended it, because I love the relax feel, the good service and most of all the good food. If I wanted to eat out at a new restaurant everyday for a year, I don't think it would be a problem. That is how many restaurants there are in Greater Vancouver, and also one of the reason why I love this place. So the question is why did I go all the way out to Abbotsford for Italian food. You see the restaurant I wanted to visit was Ah Beetz, a New York style pizzeria that a lot of bloggers were raving about, but unfortunately it did not open for lunch, so we had to to settle for something else. I am so glad we decided check out Paliotti, because it's certainly a hidden gem to me. The restaurant was quite spacious with very nice vineyard like decor. It really did have a Italian feel to it. First up is the complimentary bread. These were slightly toasted with garlic butter, so they were soft and buttery with a mildly crunchy crust. Since I am not a fan of vinegar type dips, I ate the bread as is. R on the other hand thought the olive oil/vinegar dip was great. Originally both R and I only intended to get pasta, until we noticed a section called Pizzetta right under appetizer. The first item was called Brushetta and it was only $4.95. With that price in mind, both R and I thought it would an appetizer portion, but we were so wrong. The crust was similar to flat bread, the outside was crispy, but the inside was airy and soft. I loved the garlic/extra virgin olive oil base with fresh tomatoes, and they were certainly generous with the cheese. If there is one thing you must try, this has to be it. R ordered the Chicken Asiago Tordelli ($13.95). This was a whole wheat mushroom ravioli with roasted garlic, chicken, sun dried tomato, onion, and mushroom in a creamy Asiago sauce. Although the sauce was rich and creamy, but the strong flavor of the garlic masked the slight nutty taste from the Asiago cheese. On the other hand, the mushrooms flavor really shined through with the stuffed ravioli because it was so finely chopped. I am usually the one to order cream sauce, but this time I chose a Rose sauce pasta instead: Linguine Club ($12.95). This pasta was loaded with lots of chicken, bacon, mushroom, onion and garlic (they really love garlic here). Although the pasta was al dente, and the rose sauce was delicious with a nice smokey bacon flavor, but I found it to be quite salty. Service here was pretty standard, they were friendly and checked on us once in a while. Food here was solid, everything was good if not great. Ambiance was nice. So in a nut shell, I definitely recommend Paliotti's to anyone who is visiting Abbotsford. Heck, it might even be worth the drive if you don't live too far away. I use to purchase the Entertainment book with every intention of checking out majority of the restaurants, but I always end up visiting only a few. So when this new trend of group buy popped up, I gladly canceled that subscription and started to follow these instead. I know these website are suppose to save me money, but I think I actually end up spending more because of all the 'good deals' XD. Anyways I digress, the point is that Groupon recently had a deal on a restaurant I been meaning to try, so I immediately snatched it up. Tonkatsu can be easily found in any Japanese restaurant, but a restaurant just dedicated to this one item is hard to come by. At least I don't know a single restaurant in Greater Vancouver that focus on this. However this is completely opposite in Taiwan, cause there seems to be one on every street. There is also quite a range of these restaurants, some are fast food places, while other are higher end with nice ambiance and good service. 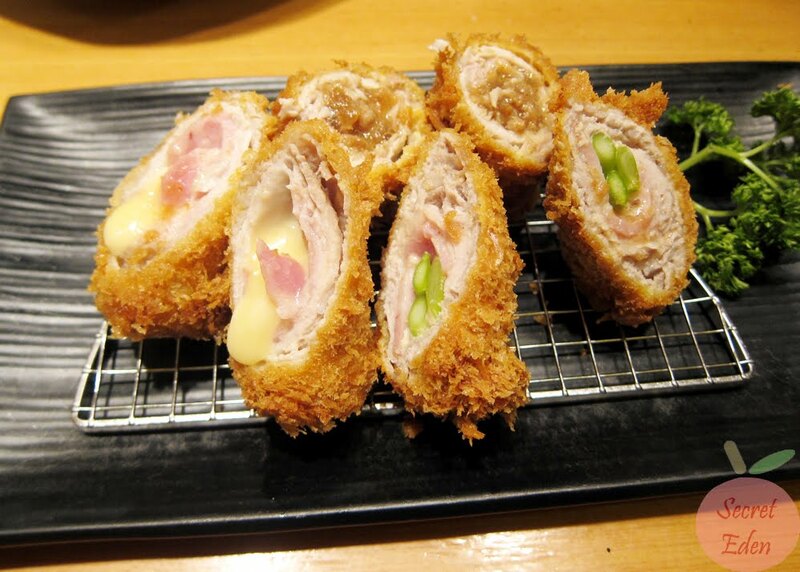 Saboten Tonkatsu just so happen to be one of those. 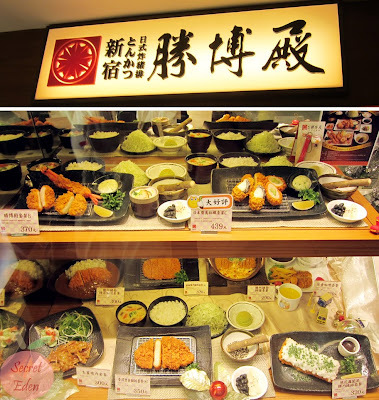 There are several good quality Tonkatsu places around Taipei, we just chose Saboten because they had one location that was very convenient for us. This branch was located on the 6th floor of Mitsukoshi shopping center in XinYi district. The first thing that came are the unlimited 'side dishes'. The first are very finely chopped cabbage, and you are suppose to drizzle the ponzu-like vinaigrette dressing on top. 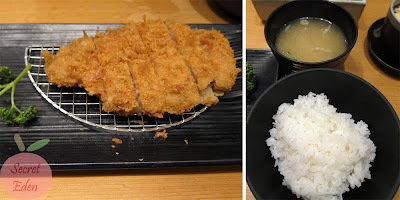 The light acidity from the ponzu sauce really open up ones appetite, and since you are just munching on light veggie, it keep the stomach relatively empty to enjoy the tonkatsu that was yet to come. They also give us some picked daikon and black beans which I didn't particularly enjoy. Next they bought out the DIY sauce 'kit', a grinder with a bowl of black/white sesame. 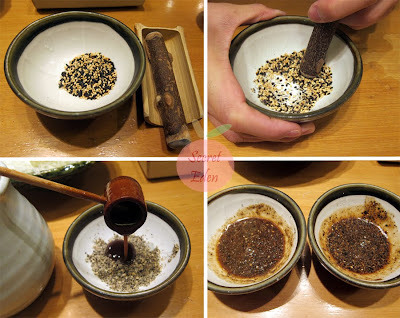 Basically, you are to grind up the sesame to any consistency you prefer, and the pour on this tonkatsu sauce to make a runny paste. The tonkatsu sauce was slightly sweet and tangy at the same time, it's hard to describe, but all you have to know that it's GOOD. R ordered the regular tonkatsu meal for around $300NT ($10). I know I know, how is that high end you ask. 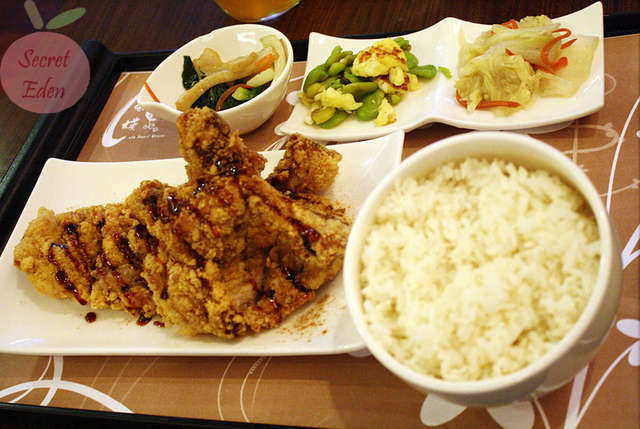 Well, let's just say you can have the same meal for only $5-6 at regular tonkatsu shop. Anyways, the pork here was super tender and juicy. The Penko crust was nice and crispy without being oily. Also, all the meal here come with miso soup and unlimited rice. I went for something different, I had the stuffed tonkatsu (3 ways) for around $350NT($12). I have to say the extra $2 was so WORTH IT. I loved all three kinds, with my favorite being the ginger flavored stuff pork in the back. All the pork used here are chewy, but the good kind of chewy. Just like the above dish, the outside crust was really crispy, this provided a nice contrast to the soft and delicious pork on the inside. Although the set meal was more than enough, but I just couldn't resist and ordered the Chawamushi. 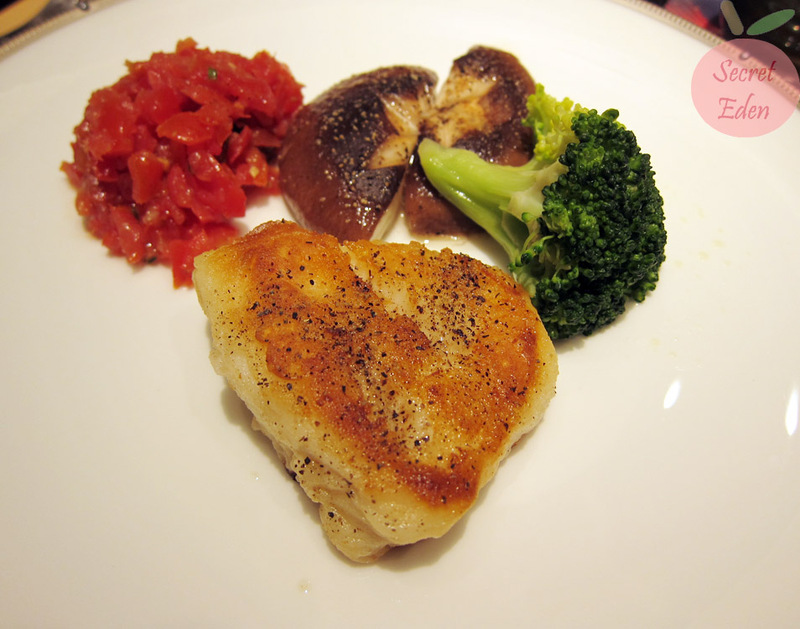 This was once again very good, it was smooth and flavorful with a hint of seafood umami taste. Overall, I definitely recommend Saboten, as their tonkatsu were seriously great. 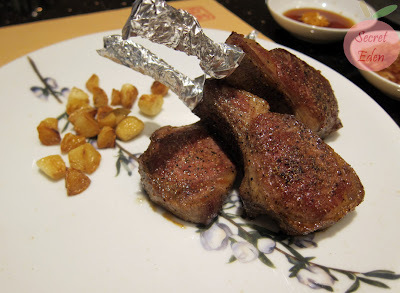 I can honestly say I haven't found a place here that serves such tender pork cutlet. So make sure you mark this place down, if you do intend to visit Taiwan.